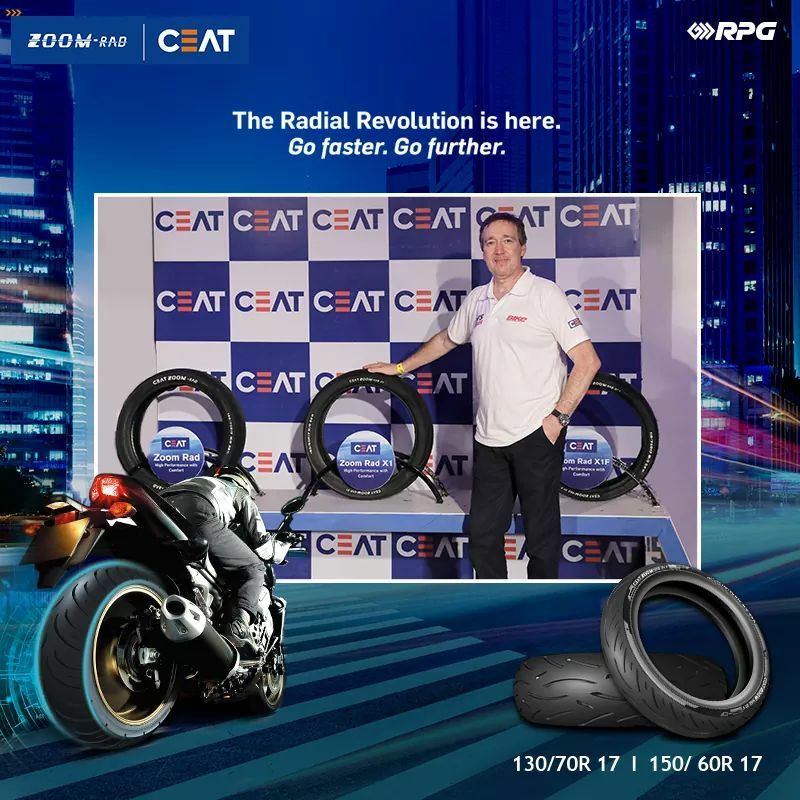 CEAT limited, one of India’s premier tyre manufacturers, recently launched CEAT Zoom Rad X1 series of tyres at India Bike Week, Goa. These tyres have been specially designed to cater to high powered motorcycles, hence the ‘H’ speed rating for speeds up to 210 kmph. Zoom Rad X1 tyres, which would particularly interest owners of 200cc-400cc motorcycles, were unveiled by the Freddie Spencer, the legendary racing rider. The tyres come equipped with a soft rubber compound which offers superior traction and a very responsive braking. With safety at the core of its product design, CEAT developed an innovative tread pattern to ensure superior wet handling and performance. A wide contact patch makes for confident high speed handling along with superior cornering capabilities. There has been a substantial surge in demand for high powered motorcycles in last few years, and this trend is expected continue for the next few years with an estimated CAGR of 20%. Companies like MRF, and now CEAT, have taken cognizance of this emerging scenario and are catering to the needs of motoring enthusiasts- amalgamation of safety and performance. With Zoom Rad X1 tyres, CEAT would be targeting popular performance vehicles like KTM Duke, Bajaj Dominar, Yamaha R15 and the likes. These tyres would be available in 110/70 R17, 130/70 R17 and 150/60 R17 sizes. CEAT, which is the safety partner for India Bike Week 2017, is also going to set up an Enduro Track Session to showcase the capabilities of its tyres in tackling the abuses of roads and uncharted terrains. This track would include various stretches like slalom cones, dirt pit and gravel to demonstrate the potential of CEAT tyres over a variety of tarmacs. Mumbai head-quartered CEAT, the flagship company of the Rs 22,000-crore RPG Enterprises, was established in 1958. Today, CEAT is one of India’s leading tyre manufacturers and has strong presence in global markets. CEAT produces over 15 million tyres a year and offers the widest range of tyres to all segments and manufactures world-class radials for: heavy-duty trucks and buses, light commercial vehicles, earthmovers, forklifts, tractors, trailers, cars, motorcycles and scooters as well as auto-rickshaws. Mumbai head-quartered RPG Enterprises is one of India’s largest industrial conglomerates. With over 15 companies in its fold, the group has a strong presence across core business sectors such as Infrastructure, Tyre, IT and Specialty. Established in 1979, RPG Enterprises is one of India’s fastest growing business groups with a turnover a turnover in excess of Rs.22,000 crore.